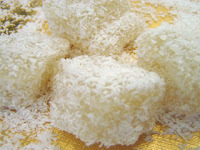 This is a typical handmade sweet (Kanom), with a texture similar to turkish delight and a rose scent. If you cannot obtain rose water, it is possible to use vanilla essence in water, or lemon or orange juice, making different types of sweet, but the authentic flavour is rose water. 100 gms - (1.1 Cups) Desiccated Coconut. Peel the cassava leaving only the white flesh. Grate the cassava flesh until finely shredded. Mix the water with the sugar and cassava then blend it in a food processor. Divide into portions for steaming, wrap each portion in aluminium foil to form parcels. You will cut these portions into smaller cubes later. Steam the parcels for 25 minutes. Leave to cool in the fridge. Remove the foil, cut the cassava sweets into bite sized pieces. Dust with the shredded coconut.